A Landstorm, or Jack Tars out of their Element, 1785, Royal Collection Trust. 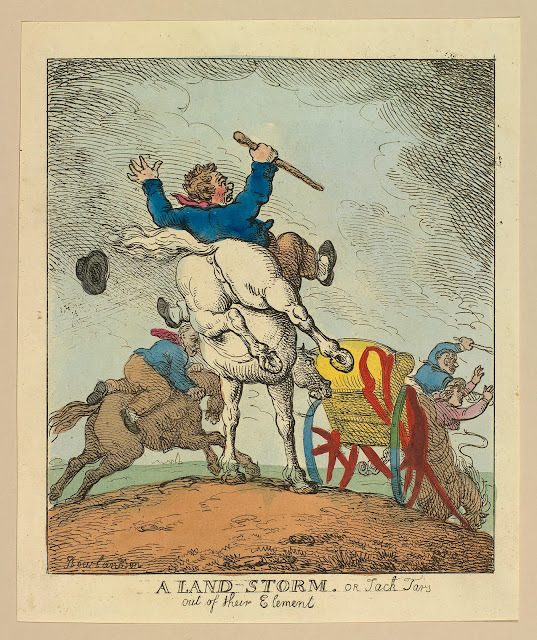 There are a good number of satirical prints involving sailors trying to ride horses. Part of the stereotypes of sailors is that they were entirely inept at anything even remotely equestrian. This stereotype has resonated through the years, even appearing in popular fiction of the age of sail, like the Horatio Hornblower and Aubrey-Maturin series. We'll see more of these images in future posts! The sailor in the center is being bucked off off his white horse. Flying away from him is his black round hat with a moderately sized brim. His blue short coat has slash cuffs and cloth covered buttons. His neckcloth is a light red solid color. The trousers are brown, and end above the ankle, revealing white stockings and pointed toe shoes. Behind him on a brown horse is his shipmate dressed in precisely the same slop clothes. Ahead of them on a carriage flying off the road is another tar with his lady, both of whom are about to be thrown. His jacket is also blue, and his trousers are white. Two out of the three jacks carry cudgels.